Obwohl Fehlinformationen und Halbwahrheiten schon lange Teil der Mediengeschichte sind, wird dieses Phänomen gegenwärtig intensiv unter dem Label „Fake News“ diskutiert. 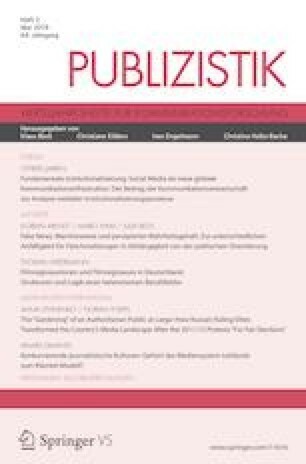 Falschmeldungen umgehen die Gatekeeper-Funktion des professionellen Journalismus, behandeln polarisierende, moralisch aufgeladene Themen, sind ideologisch und/oder ökonomisch motiviert, setzen auf eine hohe Verständlichkeit und zielen auf emotionale Reaktionen ab. Dies soll eine rasante Verbreitung über soziale Netzwerkseiten begünstigen. In der Literatur wurde die Vermutung geäußert, dass Personen mit politischer Orientierung rechts der Mitte besonders anfällig für Fake News sind. Empirische Belege für diese Vermutung liegen jedoch kaum vor. In einer zweiwelligen webbasierten Studie mit Experimentaldesign (N = 519) testeten wir daher die Hypothese, dass der Effekt der Rezeption von Fake News auf den perzipierten Wahrheitsgehalt der den Fake News zugrunde liegenden Ereignisse von der individuellen politischen Orientierung abhängt. Unsere Befunde bestätigen diese Vermutung. Ein erhöhter perzipierter Wahrheitsgehalt von erfundenen Ereignissen ließ sich nur bei Personen mit politischer Orientierung rechts der Mitte nachweisen. Dieser Effekt war außerdem über die Zeit stabil. Zusätzlich testeten wir den Effekt von Warnhinweisen. Analysen deckten ein komplexes Wirkmuster auf. So zeigte der Warnhinweis bei Personen mit politischer Orientierung rechts der Mitte keine Wirkung. Wir diskutieren die Ergebnisse im Kontext möglicher Strategien, wie mit dem Phänomen irreführender Falschmeldungen gesellschaftlich umgegangen werden kann. Hoaxes and half-truths have always been part of news content. Contemporary discussions, however, often use the term “fake news” to describe such news items, which bypass the traditional gatekeeping function of professional journalism, report on polarizing, morally charged issues, are motivated by political ideology or economic reasons, are written in plain, easy-to-understand language, and aim to elicit emotional reactions in readers. These characteristics are assumed to facilitate a fast dissemination process via social networking sites. Previous work has expressed the idea that individuals with a conservative/right political orientation are especially vulnerable to believe in the truth of fake news content. Unfortunately, there is hardly any empirical evidence testing this idea. The present study tested this hypothesis by utilizing a web-based experimental study (N = 519). In fact, we tested whether the perceived truth value for events reported in fake news items is higher among individuals with a conservative/right political orientation (versus in those with a liberal/left political orientation). Furthermore, we investigated whether a warning message that emphasizes doubts about the credibility and truthfulness (based on independent fact checkers) influences the size of the effect of fake news exposure on a reader’s perceived truth value. We utilized a 3 (type of news items: control condition without fake news, treatment condition with fake news without warning message, treatment condition with fake news with warning message; between-subjects factor) × 2 (two measurements of the perceived truth value: immediately after, approximately one week later; within-subjects factor) design. In fact, participants read news items about a broad range of topics. Importantly, participants allocated to both treatment conditions read five fabricated fake news (e. g., “Hessian kindergarten bans Wurstbrot [i. e., bread spread with thin slices of lunch meat] due to complaints by Muslim parents”). Half of the participants received these fake news items including a warning message that doubts the credibility and truthfulness of the content. Participants allocated to the control condition only read neutral news items (i. e., no fake news). All news items were constructed as items appearing in the newsfeed of the social networking site Facebook. The target outcome was perceived truth value: Immediately after reading all news items (wave 1) and in a follow-up approximately one week later (wave 2), we asked whether participants think that “this event occurred in the way as described.” We did not only use fake news items consistent with a conservative/right political orientation but also used more general events such as the supposed death of a child after Measles inoculation. We counted how many fake news participants perceived to be true. Furthermore, we assessed participants’ political orientation ranging from conservative/right to liberal/left. Analyses supported the research hypotheses: Exposure to fake news items elicited an effect on the perceived truth value only in individuals with a conservative/right political orientation. This effect could be observed when perceived truth value was assessed immediately after exposure as well as when measured approximately after one week. This indicates that the hypothesized effect was stable over time. We also tested the effect of the warning message that notes that fact checkers doubt the truthfulness of the news item. This warning message did not elicit an effect in individuals with a conservative/right political orientation. The present study provides supporting empirical evidence for the idea that individuals with a conservative/right political orientation seem to be especially vulnerable to believe in fake news. A warning message did not help to reduce the effect of exposure to fake news items. It is important to emphasize that these effects were stable over time: We observed similar effect patterns when perceived truth value had been measured immediately after exposure and in a follow-up approximately one week later. This emphasizes the societal relevance of fake news exposure: Fabricated hoax news items may engrave into news consumers’ memory. Furthermore, the present study adds to the concern in critical voices that question the effectiveness of warning messages. Although they are used with good intention, their effectiveness can be questioned. Nevertheless, more research on warning messages is needed. Future studies should test different warning messages and assess whether specific warning messages can reduce or even eliminate effects of fake news exposure. The study has some limitations. First, we only used a total of five fake news items. The low number of fake news items reduces the generalizability of our findings. Second, the sample consisted of members of a non-commercial online-access-panel. Interestingly, only a relatively low number of individuals showed a pronounced conservative/right political orientation, also decreasing generalizability. Furthermore, we used a warning message that the social networking site Facebook used during the time period, in which we collected the data. However, social networking sites continuously change their strategies on how to deal with fake news. Therefore, future studies should test different warning messages. Despite the limitations, the present study shows that individuals with a conservative/right political orientation seem to be especially vulnerable to the influence of fake news exposure. A warning message did not help to reduce the fake news effect. Vollständiges Regressionsmodell, das für die Überprüfung von Hypothese 1 gerechnet wurde; zur Johnson-Neyman Technik vgl. Hayes und Matthes (2009). Gerechnet wurde das Modell mit PROCESS (Hayes 2013). Der komplette Output der PROCESS-Analyse kann vom Erstautor erhalten werden. Wir berichten unstandardisierte Regressionskoeffizienten (B). Johnson-Neyman-Technik: Wert, der die Signifikanzregion definiert = 3,5387.